Hey, who wants some delicious recipes?! Who could use to spice up their kitchen with some fabulous new meals?! So I'm reposting this recipe, that I swear I've talked about a hundred times. But then, check out the linky attached, it's got a ton more fabulous eats! Hubby and I love this recipe from my pal Mrs4444's lovely family cookbook....altered only slightly. Bonus--it's super easy to make! **Fry up beef or turkey until brown. Put all ingredients into a crockpot on low for about 2-4 hours. Serve with shredded cheese, sour cream, guacamole, and use tortilla chips to scoop! Guess what we're having tonight!! Yes, and we have it about 3 times a month, no lie. This looks so easy! I'm looking forward to making it. Chili is my favorite...can't wait to try this recipe! Never tried a chili. Seems that i have to do it, cause it looks so easy to make and tasty. I think I have all these ingredients in my house. Might have to make this tonight! We looooove chili in my house! Ok, so I added my link....I've never participated in a MCKBlog hop before...hope I did it right! We love chili at our house, usually Hubby makes it. 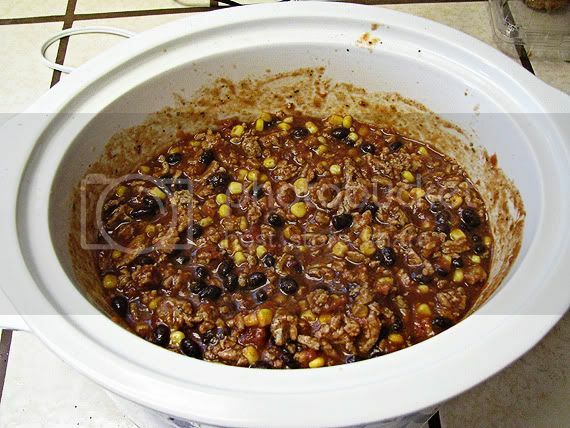 But it would be good to give a new recipe a try especially since it uses a crockpot, very easy on a busy day. We have that all.the.time. But down here in TX we call it taco soup. And my husband doesn't eat beans, so sub in a handful of egg noodles for the beans. It's still yummy! Yum! I make something kind of like this...a cross between chili and taco soup! That looks super easy! I am going to give it a try. Thanks for sharing! looks good, we will have to rey this! Hopping around... and love that posted about Chili too! I like your blog :) I am having a great time collecting things to try from the blog hop! I currently have this cooking & I can't wait to dig into it! It smells so yummy! Thank you for the recipe! This is definitely a different kinda chili. Going to have to try this. This is different. I love different, thanks for sharing. I love chili with everything in it, esp beans. This recipe does sound wonderful!!! I want to try it! I love chili with everything in it esp beans! This does look wonderful, and I'd like to try it!! !